In January 2016, LG Display's Vice-Chairman said that the company's goal is to ship 1 million OLED TV panels in 2016 and 1.5 million in 2017. 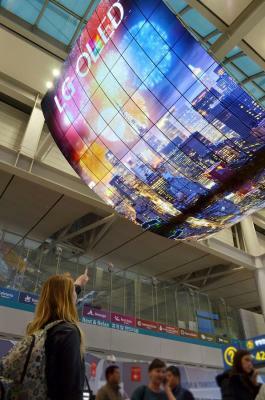 In 2015, LGD shipped around 400,000 OLED panels. According to a new report from Korea, LG was recently able to increase the production yields at its OLED TV fab, and is increasing its production target to 1.7 million panels in 2017. As we've seen in the past, the product mix (between 55" and 65" panels) has a major effect on the number of panels LG actually produces - when more consumer prefer 65" panels, LG can make a smaller amount of panels in total. In August 2015 LG Display announced plans to invest around $8.5 billion in OLED capacity in the next three years as the company shifts its focus to OLED displays. Later in November LGD announced that it will build a new OLED display plant in Paju, Korea. The P10 fab will mainly make large-size OLED TV panels and flexible OLED panels. The total investment in the P10 plant is estimated at KRW10 trillion ($8.7 billion USD). In early 2016, LG Display said that it will invest $380 million to expand its OLED TV production capacity. LGD will convert an existing LCD production line to OLED production. The investment will begin in Q1 2016 and will be completed by Q2 2017. Any predictions when a manufacturer will be able to offer a 27-30" 1440p or 2k display for monitors in the sub 500$/€ range?